ONE OF THE WAYS Americans have made the apple distinctly our own is in the kitchen. Of course there is Waldorf Salad, introduced at the Waldorf Astoria Hotel in New York City in 1893. The original recipe of maître d’hôtel Oscar Tschirky comprised diced red-skinned apples, celery, and mayonnaise. Eventually, chopped walnuts were added to the mix, and today a wide variety of apples of any color can be used to make this unique salad. Then there are a trio of desserts that share simple crusts and colorful names: Apple Brown Betty, Apple Cobbler, and Apple Pandowdy. All were favorites in early New England for their economy and ease of preparation, and, of course, their rich apple flavor. Apple cobbler has a thick, biscuit-like crust over a deep-dish filling. In some versions, the crust encloses the filling like a pie, in others the batter is dropped in spoonfuls on the top. While popular in New England, cobblers may have originated in Europe, deriving their name from their uneven crust resembling cobblestone streets. Apple Brown Betty is a pudding-like dish featuring apples baked between layers of buttered breadcrumbs. Betties also have European roots, originating in England and closely related to the French Apple Charlotte. This was a popular dish during Colonial times, although the name Apple Brown Betty only dates back to the mid-19th century. Pandowdy is another deep-dish apple dessert, spiced and sweetened with maple syrup, molasses, or brown sugar. Pandowdy differs from cobbler in that its biscuit-y topping gets pushed down into the fruit as it bakes, allowing the apple juices to bubble up through. Apple Pandowdy has been traced to the early 1800s, but the origin of its name is unclear. It may refer to its simplicity and dowdy look. ONE DEFINITION OF “COBBLE” is “to mend or patch coarsely.” We cobbled together our recipe from several cookbooks and sources, starting with a whole-wheat dough adapted from Joy of Cooking. For apples, we chose two Fujis, one Honeycrisp, and one Macoun, all good sized (most recipes called for six apples). We used less butter and sugar than most recipes called for, and the result was a delicious cobbler brimming with apple flavor, with a touch of lemon and cinnamon. Cobblers are best eaten while still warm from the oven, topped with vanilla ice cream or frozen yogurt, whipped cream, or even a dollop of tapioca pudding. Preheat oven to 425°. Core and slice apples. Mix with sugar, cinnamon, lemon juice, and zest, coating slices. Place in 3-quart casserole or baking dish. Put vinegar in measuring cup and add enough milk to make one cup. Set aside. Mix dry ingredients in bowl. Cut in butter with knives or pastry blender until crumbly. Add milk mixture and mix with a fork until it forms a soft dough. Knead 8-10 times on lightly floured surface, and roll out by hand to about 1/2” thick. Shape to fit baking dish, and place over apples. Make several inch-long cuts in dough to allow steam to escape. Cook for 50 minutes, or until apples are soft and crust is brown. 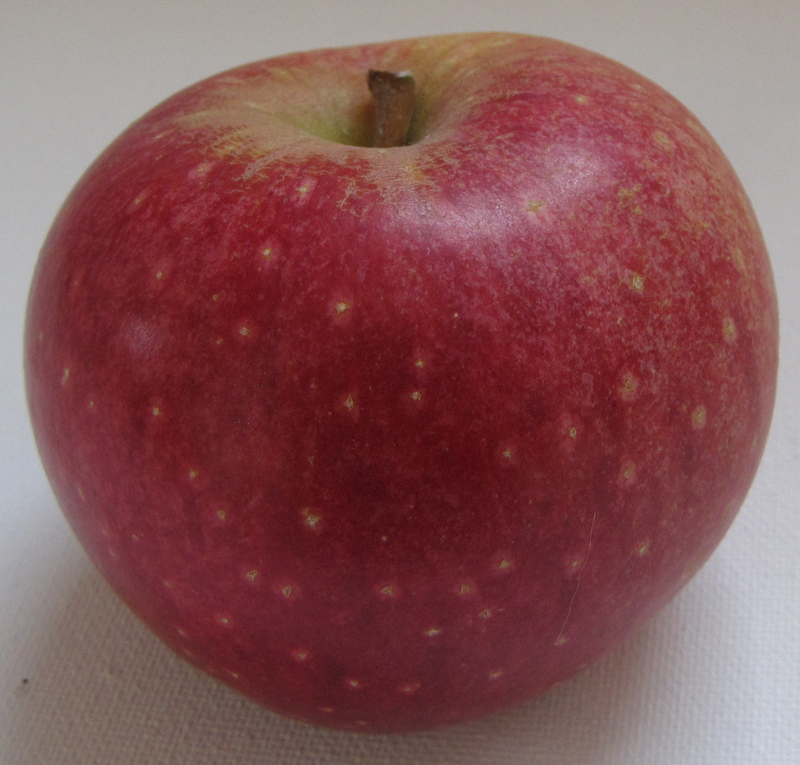 Fuji is a good late-season apple that can be found in more and more New England orchards. 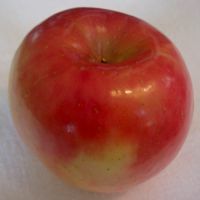 It has a dense, firm flesh but is very juicy, with a sweet flavor owing primarily to its Red Delicious parent (Fuji’s other parent, the Virginia heirloom Ralls Janet, is a good eating apple known for its late bloom, making the variety less susceptible to frost damage.). Fuji is a medium to large-sized apple, excellent for fresh eating, baking, and drying. Fuji is a great keeper, maintaining its quality for several weeks left in a fruit bowl or for up to a year refrigerated. Fuji was developed in Japan in 1939, and was named in 1962, after Japan’s tallest and most sacred mountain. IN OCTOBER we published a post, Seek No Further, expressing our interest in locating the heirloom apple Westfield Seek-No-Further. A reader responded with one possible source, Bear Path Farm in Whately, Massachusetts. We visited the small orchard, but the Seek-No-Furthers had already been picked. A little later we received an email and photographs from a grower, Walter Curtis of Honey Hill Farm in Fayette, Maine. Imagine our surprise this week when a box of beautiful Westfield Seek-No-Furthers arrived in the mail from Walter! We are deeply indebted. 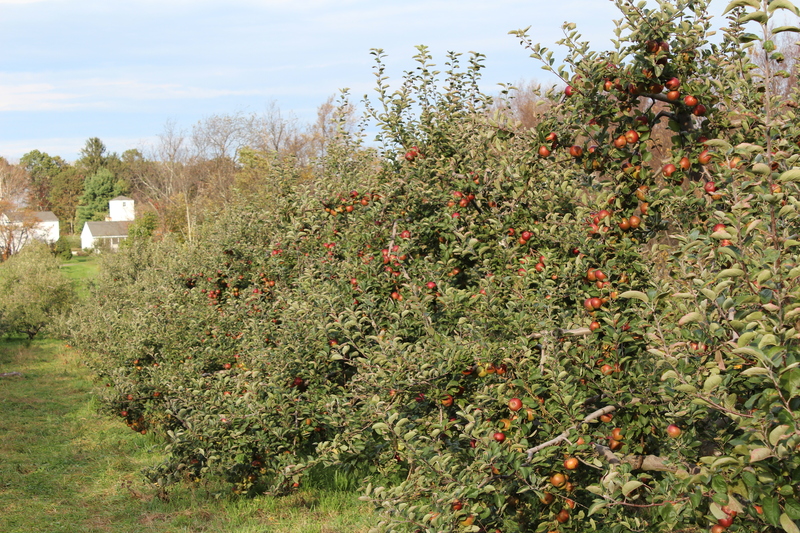 We’re happy to say that, thanks to Walter, Westfield Seek-No-Further will soon appear on our New England Apples website (among the 30 new varieties we will be adding later this fall to the more than 100 already photographed and described). Westfield Seek-No-Further is a sweet, aromatic apple with a slightly nutty, almost buttery flavor. Primarily a dessert apple, it is not generally recommended for cooking. Seek-No-Furthers have a creamy yellow, firm, crisp flesh. Their skin has a smooth, deep yellow or greenish base, and can be streaked red, with some russeting around the stem. Westfield Seek-No-Furthers originated in Westfield, Massachusetts, in the 1700s, and were a popular New England variety in the 1800s, especially in Connecticut, New York, and the Midwest.